In June 1917 Fokker decided to design a triplane. 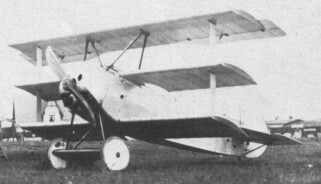 A demonstration machine, the D.VI biplane (werknummer 1661) was under construction for Austria-Hungary, and this was completed with a third wing. At first this D.VI (which was later designated V.3) had no interplane struts. Its powerplant was the 110 h.p. Oberursel rotary engine (Fokker had a share in the Oberursel Engine Works). The D.VI was flown by Lt Werner Voss, who was enthusiastic about the type. The Air Force took an interest, and on 14th July 1917 the first batch of 20 triplanes was ordered, including three prototypes, comprising a second D.VI and two V.IVs (later the V.4). The first D.VI (V.3) triplane was sent to Austria-Hungary after its tests.